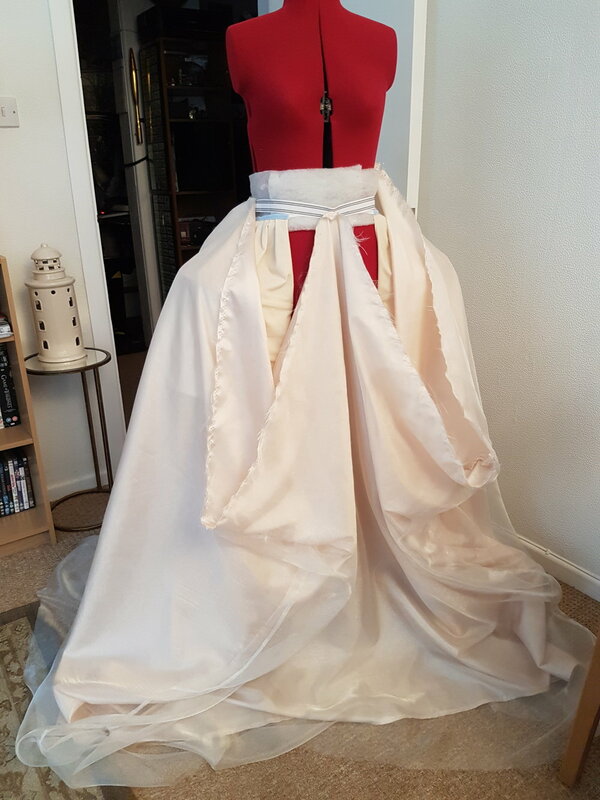 Hello again :) I'm going to share with you my little journey of making a whole lot of dress! Back in September me and my family decided it would be a great idea to throw a surprise 40th party for my sister's birthday in February. While we pondered the options of a theme we decided on the 80s and then Jo (birthday girl) could be Sarah from the labyrinth which is one of her all time favourite films. I would be making the dress which was a tad daunting but I can't resist a challenge. From an 80s theme it turned into the Labyrinth with a masquerade theme like the one from the ballroom scene, complete with floaty decorations, trees (yes trees) a gold clock and hanging candelabras from the ceiling. All made by my fabulous dad who can and will make everything from anything, once he even made a time machine from a Delorean! If you haven't seen the labyrinth yet then I think you should! It's a story of a young girl (Jennifer Connolly) who has to solve the labyrinth to save her baby brother Toby from Jareth, the goblin king (David Bowie) before he gets turned into a goblin. It's a dark fantasy film with all sorts of otherworldly creatures from fairies that bite to talking worms, all produced by Jim Henson's creature workshop. Aside from the plot it is a coming of age story full of metaphors of a childhood innocence lost. One of my favourite parts is when Sarah has to remember a line to defeat the goblin king once and for all.. you have no power over me. 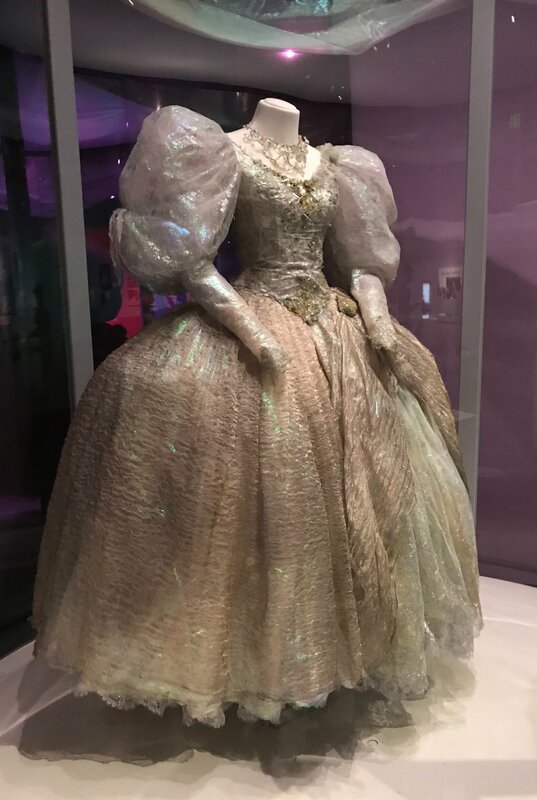 So this is the actual dress which has been on display in Seattle at the museum of pop culture. As much as I would have loved to see it in the flesh Seattle is a bit far for me right now so instead I found these pictures on a blog which explains the dress in detail. Thankyou Ariacouture! My first thoughts are my what massive sleeves and look at that wide skirt. The skirt has a Georgian style silhouette so I knew I would have to make a foundation garment to create this look. Below is an example of a Georgian dress that I saw displayed in the bath fashion museum. A friend and fellow costume maker very helpfully sent me a pattern for the panniers that I needed to make, it was a pretty simple pattern and a one size fits all with ties at the sides. The almost finished and finished panniers,I made from some calico I had lying around and bought some hoop steel rods to go inside the channels to make them hold the shape. I love this place, there must be 15 shops each with rolls and rolls of fabric. If you can't find it here you won't find it anywhere. I needed fabric for the bodice, lining, underskirt and overskirt plus some sheer fabric to create a shimmery effect on the dress. We searched and found some dare I say it, cheap satin fabric for the bodice and underskirt. It had a slight pink tinge to it but with a chiffon overlay I hoped it wouldn't be too overpowering..a decision I later regretted haha. Oh and if you are wondering it's defintely not the pink fabric in the picture below! 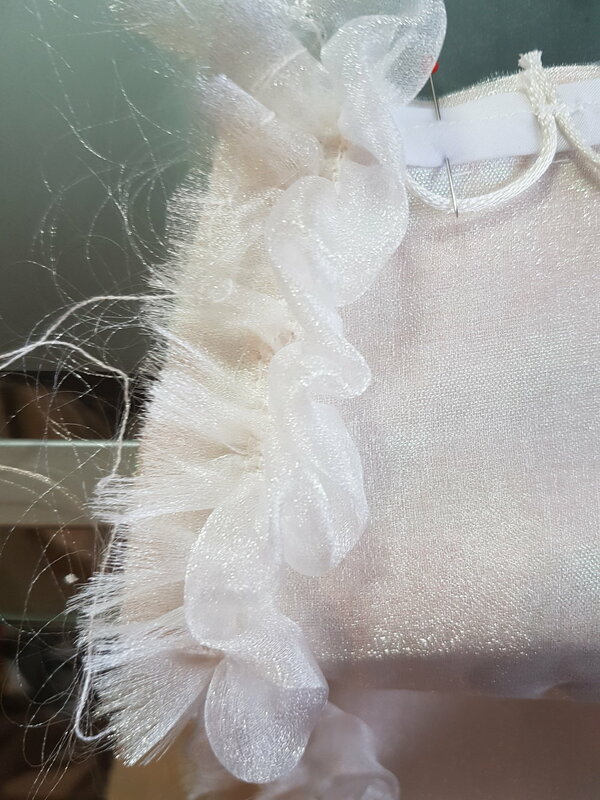 For the overskirt we found some gorgeous crinkle silk gold metallic fabric (this is where the pink tinge fabric clashed) It was pricey but irresistible and perfect for the skirt as you can see in the pictures of the real dress above it also has a crinkle effect. We managed to knock the price down a bit since we were getting a few metres of it yay! The chiffon fabric below on the left I used to layer up on the bodice and the organza mirror effect fabric I used for the puffy sleeves. For the underskirt I used the method of hemming from the waist that I had learnt at the northern college of costume for my Tudor petticoat. I used widths of fabric stitched together to form a ring of fabric which I then hemmed along one edge. I attached a petersham band on the waist and tied elastic around it it hold the fabric in place, I then marked the back, front and side points and pleated each quarter pinning each pleat in place to the band ready for stitching. I used a layer of satin and a layer of chiffon, stitching them both together to use as one piece. I then stitched a strip of satin over the petersham waistband and finished the back with a placket and hook and bar. For the bodice I used Jo's measurements to draft a bodice block which I then converted into a princess seamed v neck bodice. It was very much an experimental process and I could have chosen to use a commercial pattern but I wanted to practice my pattern making skills so I had a go. It's not perfect but the result wasn't as bad as I feared since I couldn't do any more fittings with my sister incase she would guess something was up. I shifted the shoulders on the pattern to make them fall slightly off the shoulder as they do in the film and hoped I could attach the sleeves later without them being too heavy and dragging them down too far. For the structure of the bodice I decided to use spiral steel boning to help keep the shape and make it robust enough for those puffy sleeves. I used a calico interning and made boning channels with bias binding alongside each seam. For the back fastening I decided I should use a corset style lace up with a modesty panel so that the sizing could be adjusted as required. 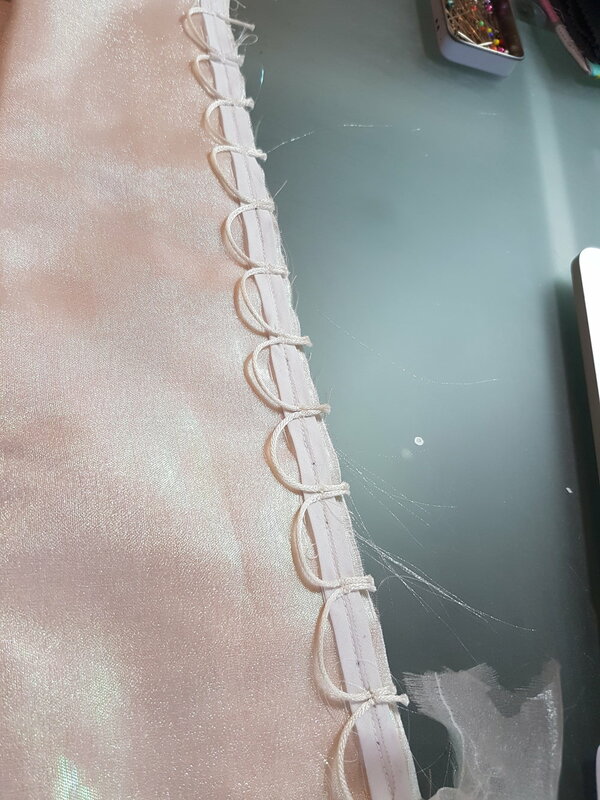 I was thinking of using eyelets but decided it would look too bold for the dress so I opted for making loops with a satin..what do you call it string, no it's cord that's the word Im looking for. It took quite a while positioning them all equally, I even had to hand sew them afterwards to make them extra secure. Along the top edge of the bodice I thought it would be nice to add an extra detail so I used some strips of gathered chiffon to sew into the seam. Sleeves..oh the sleeves! I decided I might need a little extra help so I bought an old 80s wedding dress McCalls pattern to help me out. Actually I love them and I want to make one for me, just so I can swan about the house with giant sleeves. I picked version A and made a trial version of it pictured below. I thought It looked great but didn't quite have the impact of Sarah's dress so I altered the pattern to make the puff a bit longer and wider so that it goes all around the arm rather than just having puff on the shoulder. I backed the main fabric with tulle to give it a bit of extra oomph. The updated version below. It was just a bit saggy because of the volume of fabric and the netting inside wasn't enough so I got around this by stuffing the sleeve with extra tulle which did the trick. At this point I was pleased but had to call an emergency panic meeting with my mum because of the pinkness of the bodice and the clashing of the skirt which then led me to worry the dress would make Jo look frumpy.. It was beginning to dawn on me how many people would see the dress and how I wanted Jo to be pleased with it. I eventually decided I would add some gold fabric along the neckline to help tie it in with the skirt which made it less clashy. I wanted to add some detail to the front of the dress but I was running out of time to be sewing on individual beads, we are talking the day before the event now. So I took myself off to the fabric shop to find solution. As I was browsing I saw some bridal appliqué's that were perfect for what I needed. I had fun picking some out and hand stitched them to the dress along the neckline and along the bottom edge of the sleeves. The party was a huge success and the dress fit perfectly, Jo had no idea about the surprise until we all put on our dresses and the photographer turned up! We definitely weren't just going out for dinner at a hotel as was our cover story although I thought we had blown it in the hotel room when she asked us why we had ordered pizza if we were going for dinner! We explained the portion sizes at dinner would be small!